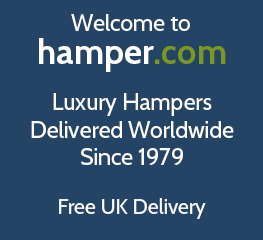 Welcome to award winning hamper.com, luxury hampers delivered worldwide since 1979. Beautifully designed gift hampers from £20 with free UK delivery. Find the ideal present from one of the largest online hamper ranges in the UK with gift hampers, gift baskets & food gifts suitable for all occasions. All our UK food hampers are made by us by our in-house hamper creation team, unlike many of our competitors. Buy luxurious cheese, chocolate, wine and alcohol free hampers from hamper.com today and choose from free next day delivery or delivered free on a day of your choice. What goes into a hamper? Each one of our hampers are hand packed using the finest gourmet food and/or drink contents from small artisan producers, larger household brands and from international food producer, and will vary from fresh produce such as cheese, smoked salmon and fruit to non perishable long life foods such as biscuits, popcorn, crackers and canned fruits. Drinks wise there are two options, alcoholic drink such as wine, Champagne, beer, gin and spirits. Non alcoholic drinks include presse, juices and lemonade. Occasionally other non food items can be found in the hamper, these include teddies, scarves, balloons & wine glasses. What are hampers in the UK? In the United Kingdom hampers are defined as a collection of food & drink items usually presented as gifts in a box, sometimes including a wicker basket. In many countries around the world, hampers are called gift baskets or food gift basket, these gifts are exactly the same as a hamper, just a different name, but the delicious food and drink contents are just the same as the UK. The packaging of the gift hamper can also vary from an open basket, gift tray, gift box or in a traditional wicker basket. Hamper.com supplies hampers packed with delicious food and drink delivered to all addresses in the UK with free next day delivery available to most United Kingdom destinations. We make the hampers ourselves in our Oxfordshire hamper creation centre using only the finest, freshest food available worldwide unlike many other hamper retailers and department stores who sell hampers made by other hamper companies. You can send our food gift baskets and luxury hampers all over the world and a gift hamper is a fantastic way of showing someone special how much you care, whatever the occasion. Hamper.com has spent 40 years creating the very best gifts to send to the whole family, friends and for businesses. Explore our gift baskets range now and find the perfect luxury gift hamper for male and female recipients alike with our selection of scrumptious food and indulgent wine, beer and non alcoholic choices for men and woman and see why hamper.com is perfect place for gift ideas and inspiration. We source only the best freshest food and tastiest drink to go into each of our gourmet hampers. For seasonal hampers that are perfect as gifts for special occasions throughout the year, have a wide selection of Hampers For Mother’s Day, Valentine Hampers, Easter Gift Baskets and Father’s Day Gift Hampers. Finding the right Christmas gift for a family member, friend or work colleague can be a difficult task but we can we help. We have created a luxury hampers Christmas range that are packed with delicious festive treats, perfect for enjoying with family over the holidays and sending as gifts in the UK or as presents Worldwide. Our gifts baskets are shipped to destinations all over the world with hamper.com's fast international delivery service. From the USA and Canada to Australia, New Zealand and beyond, we ship and export high-quality gift hampers to loved ones overseas with our express worldwide delivery service, delivered in just a few days. All our gourmet food hampers include local and international sourced foods. From artisan food companies to larger recognised food brands there is food and drink hampers for all tastes and budgets. Hamper.com also cater for many dietary and religious food requirements with a range of gluten free, vegetarian and alcohol free hampers. With luxury hampers available all year round and with a starting price of just £20, you'll always know where to buy cheap, value, well priced and bargain gift hampers for all budgets and for all occasions. Occasionally we discount our hampers and send a special offer promotion to you, so to make sure you don't miss out on saving money, make sure you subscribe to our emails. Some great ideas for occasions to send your hamper to family and friends as well as corporate clients and staff gifts, are as a birthday hamper, retirement gift basket, get well soon hampers, thank you presents and more.